With just 1 day left before the first game of the season begins, I will take a look at what I expect to see from teams this season. Last year, we had a few teams take the next step in their pursuit for the Superbowl. Ultimately, the New York Giants took home the trophy. This year, I expect a few different teams to shine, and a new team to take home the trophy. 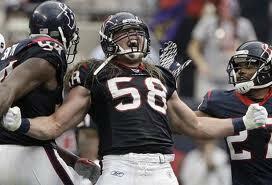 Brooks Reed will help lead the Texans very deep into the playoffs, as the Texans look to win it all. Ahhh! August 1st is upon us. The days of July are behind us and the month of August brings us some football. Training camps are going along, and the preseason games will begin soon. With that being said, let’s take a look at the NFC, division by division, and let’s see what position battles will be taking place during camps and the preseason games. Atlanta Falcons – The Falcons weakest spot on offense last year was at Right Guard. A position that is not heavily talked about, will turn out to be the main focus for ATL coaches during camp. All eyes will be on the guys who think they can improve the position. ATL switched guys several times last year. They brought in veteran Vince Manuwai, and drafted Peter Konz, to hopefully improve the RG spot. With those 2 in camp, as well as Reynolds and Hawley from last year, expect a feisty competition that will likely go down to the last preseason game. I think Konz is the future at RG in ATL, and could be starting week 1. Carolina Panthers – The Panthers love having some good RB’s. They resigned Williams to a huge contract a few years ago, and also have Stewart, who has also shown he can handle being the starting RB. Heck, if both got hurt, they still have Mike Tolbert who can handle the duties. Williams started most of the games last year, but Stewart saw a lot more snaps. Look for more of the same this year. Williams should start, but Stewart will get more snaps. New Orleans Saints – The Saints have had a busy offseason to say the least. One thing they can be proud about is the 3 headed monster of Sproles-Ingram-Thomas. Those 3 will all likely get many carries throughout the season. Sproles will likely handle PR duties, and 3rd down duties, and I expect Ingram to have a strong role in the running game. I think Ingram will be the starter, with Thomas getting a few carries here and there, and Sproles being the pesky little guy, he is so great at doing. Tampa Bay Buccaneers – The Bucs made it clear they wanted another RB, when they drafted Doug Martin. Martin enters TC as the #1 RB, but #2RB, LaGarette Blount, had some success last year as the starter of the Bucs. Martin has looked good in pass protection as well as showing some good hands out of the backfield. Expect Martin to be the starter come week 1, but Blount will probably see some carries as well.